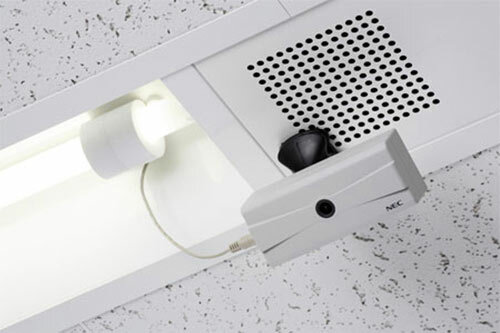 As odd as it may seem, the unnamed camera simply needs to be fixed to the ceiling beside a fluorescent light and connected to it by a wire with a ring-like adapter on one end. When the light is switched on, electricity is then generated by the Sharp-created technology in the ring through electromagnetic induction. Key to the development is not the flicker of a fluorescent tube that we’re so familiar with, but the magnetic field created by the AC source in the light. A field frequency of 45-100kHz can be used by the ring to generate 120mW of electricity, which is enough to power the camera. From that point on the otherwise-standard camera - VGA resolution with shots every 10 seconds - takes over, beaming its images to a PC using an ordinary Wi-Fi chip that also draws power from the light. NEC suggests that its camera could be installed in office light fittings to help companies keep an eye on their staff at work or in supermarkets for analyzing shopper behavior. So, suspicious cheapskates and manipulative marketers are probably rubbing their hands in glee. Sponsored links: We offer all kinds of certification exams including 642-637 dumps and microsoft dumps certifications. Our guaranteed ccsp dumps are freely accessible all around the world of mcse with 1z0-051.